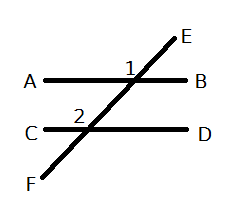 AB and CD are two parrellel lines intersected by line EF. 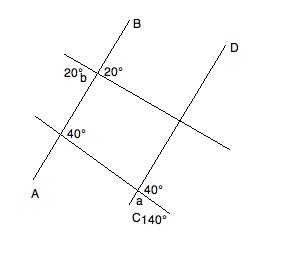 If the measure of angle 1 is , what is the measure of angle 2? 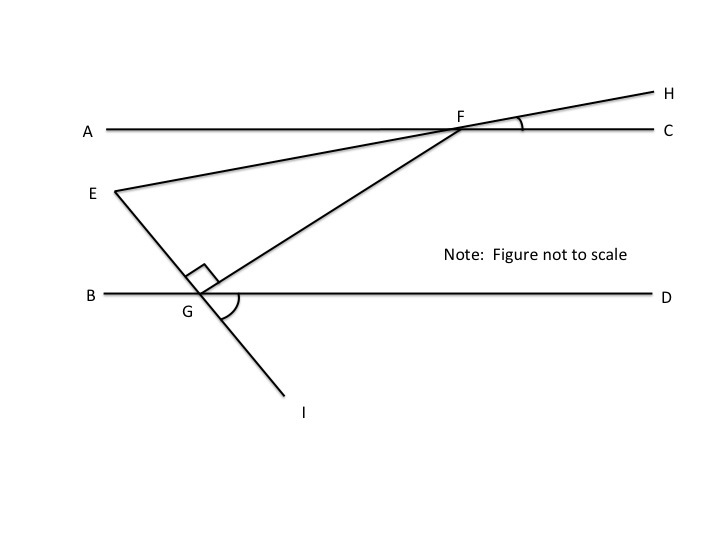 The angles are equal. 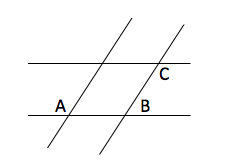 When two parallel lines are intersected by a transversal, the corresponding angles have the same measure. A student creates a challenge for his friend. He first draws a square, the adds the line for each of the 2 diagonals. Finally, he asks his friend to draw the circle that has the most intersections possible. How many intersections will this circle have? The answer to this problem is 12. 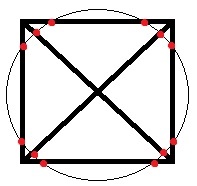 This can be drawn as shown below (intersections marked in red). We can also be sure that this is the maximal case because it is the largest answer selection. Were it not given as a multiple choice question, however, we could still be sure this was the largest. This is because no line can intersect a circle in more than 2 points. Keeping this in mind, we look at the construction of our initial shape. The square has 4 lines, and then each diagonal is an additional 2. We have thus drawn in 6 lines. The maximum number of intersections is therefore going to be twice this, or 12. 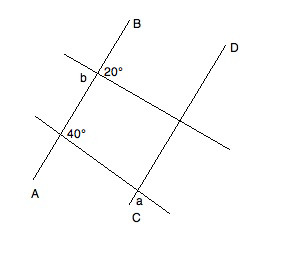 Since we know opposite angles are equal, it follows that angle and . Imagine a parallel line passing through point . The imaginary line would make opposite angles with & , the sum of which would equal . Therefore, .